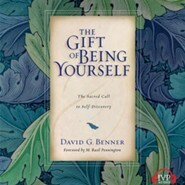 In this profound exploration of Christian identity, psychologist and spiritual director David G. Benner illuminates the spirituality of self-discovery. He exposes the false selves that you may hide behind and calls you to discover the true self that emerges from your uniqueness in Christ. Freeing you from illusions about yourself, Benner shows that self-understanding leads to the fulfillment of your God-given destiny and vocation.Rest assured, you need not try to be someone you are not. But you will deepen your experience of God through discovering the gift of being yourself. "Grant, Lord, that I may know myself that I may know thee." Augustine Much is said in Christian circles about knowing God. But Christians throughout the ages have agreed that there cannot be deep knowledge of God without deep knowledge of the self. Discerning your true self is inextricably related to discerning God's purposes for you. Paradoxically, the more you become like Christ, the more you become authentically yourself. 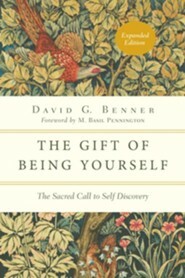 In this profound exploration of Christian identity, psychologist and spiritual director David G. Benner illuminates the spirituality of self-discovery. He exposes the false selves that you may hide behind and calls you to discover the true self that emerges from your uniqueness in Christ. Freeing you from illusions about yourself, Benner shows that self-understanding leads to the fulfillment of your God-given destiny and vocation. Rest assured, you need not try to be someone you are not. But you will deepen your experience of God through discovering the gift of being yourself. This expanded edition, one of three titles in The Spiritual Journey trilogy, includes a new epilogue and an experiential guide with questions for individual reflection or group discussion. 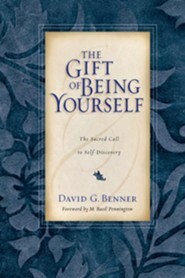 "As he has done many times before, David Benner guides us to a place of wisdom and devotion with this beautiful book. With empathy and insight he demonstrates that the two great tasks of lifeknowing God and knowing ourselvesconverge into a single adventure as we are drawn into the arms of our loving God." I'm the author/artist and I want to review The Gift of Being Yourself: The Sacred Call to Self-Discovery - eBook.